Therapeutic Massage, Synergystix, PeterboroughMassage therapy is the manipulation of the body’s muscles, connective tissue, tendons, ligaments, and joints to cause a therapeutic response, such as increasing mobility, eliminating pain, or improving circulation and lymphatic drainage. By stretching and loosening connective tissues and muscles and by promoting the circulation of blood and lymphatic fluids, massage offers relief from the pain of many injuries and conditions. It can restore internal balance, take out adhesions, correct posture, enhance immune system functioning, aid in relaxation, reduce depression and anxiety, relieve stress and mental and physical fatigue, and improve sleep. Post-surgical Massage to reduce pain and swelling by gently encouraging lymphatic fluid to leave the surgical site. Prenatal Massage and Pregnancy Support to relieve discomfort in muscles and joints supporting extra weight; ease constipation, gas, and heartburn by stimulating intestinal movement; and reduce excessive fluid retention and slow the progress of varicose veins by enhancing circulation. Labour Massage to relax muscles and decrease the effects of stress so as to reduce the sensation of pain and ease delivery. Infant Massage to encourage muscular co-ordination and suppleness; to stimulate the circulatory system aiding in the baby’s heart rate, breathing, and digestion; and to help your baby relax and sleep. Neuromuscular Therapy: A therapist identifies imbalances within the central nervous system (brain, spinal cord, and nerves) and the musculoskeletal system (skeleton and muscles) and returns the body to a state of homeostasis or balance through systematic and site-specific massage. Neuromuscular Integration and Structural Alignment (NISA): A therapist treats the fascia or connective tissue surrounding muscles, bones, and organs. Over time or because of injury, repetitious movement, or strain, the fascia can become thick and tight, and layers of the fascia can adhere, restricting movement and causing chronic pain, recurring injuries, and changes in posture and gait. NISA alters chronic habits of posture by stretching, softening, and releasing the fascia, freeing the body to resume proper functioning. Trigger Point Therapy: A therapist will find and treat muscles that refer pain to other parts of the body. These trigger points can be latent, causing muscle shortening or weakening but not pain, or active, giving rise to symptoms. Myofascial Therapy: A therapist will work on the fascia surrounding and separating muscle tissue to eliminate pain and dysfunction. Craniosacral Therapy: A therapist will gently manipulate the skull to remove restrictions in the flow of cerebrospinal fluid, relieving stress, decreasing pain, and enhancing the body’s overall health. Deep Tissue Massage: A therapist will work a specific joint muscle or muscle group by starting superficially and slowly deepening the massage. 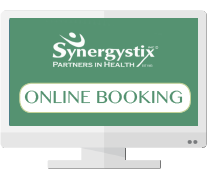 On your first visit to Synergistix, you will complete a medical case history. This information and anything you discuss with your therapist or with other professionals at Synergistix remains confidential. Your health record is never released or transferred without your written consent. You and your therapist will develop a personal treatment plan together, one that meets your individual needs. And you may easily consult other health-care practitioners at Synergistix, such as a fitness counselor, if this would help in your treatment. Your privacy will always be respected; your therapist will obtain your consent to work on various parts of the body, will discuss whether you wish to be fully clothed or fully or partially covered with sheets or blankets during treatment, and will monitor your level of comfort and of pain tolerance during treatment. Your treatment can be changed or ended at any time you wish, and you will be reassessed at an appropriate and agreed upon time. 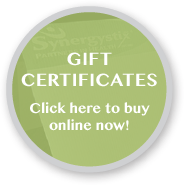 We strive at Synergistix to provide effective and discrete therapy that is tailor-made to fit your physical and emotional needs and your lifestyle, therapy that works.